Recently, local anti-fascists received a tip from a Seattle business that Greg Johnson, editor-in-chief of Counter-Currents Publishing, was living in Seattle, Washington. We decided to check into this as Greg Johnson is an internationally known white supremacist and white nationalist. Recently, the Southern Poverty Law Center wrote a detailed account of Greg Johnson’s career in white nationalist circles. We encourage you to read that piece here. In the SPLC article it is stated that Greg Johnson decided to leave the U.S. for “much cheaper climbs in an area of the world that has a much less oppressive social environment than the United States.” However, Seattle anti-fascists found Greg Johnson outside his apartment building waiting on a ride to the gym. Originally published by Puget Sound Anarchists. We would like to point out a few things that Greg Johnson and Counter-Currents are involved in. Counter-Currents publishes and distributes books from a wide collection of white supremacists. In 2017, Counter-Currents distributed James Mason’s Siege. This book is the inspiration for the Atomwaffen Division, a group of violent neo-Nazis responsible for 5 murders in the past 8 months. The mantra of “Read Siege” is widely seen in neo-Nazi circles. Both Nicholas Giampa,the accused murderer of his girlfriend’s parents in Reston, Virginia, and Samuel Woodward, the accused murderer of Ivy League college student Blaze Bernstein, used the mantra on their Twitter profiles. Counter-Currents also hosts forums where well-known speakers come to town to address their fellow neo-Nazis and white supremacists. The Northwest Forum has brought violent racists to Seattle such as the founder of Identity Evropa Nathan Damigo. Damigo was once convicted of pulling a gun and robbing an innocent man for “looking Iraqi.” Other forum speakers have included Colin “Millennial Woes” Robertson, Augustus Invictus, Jared Taylor and Kevin MacDonald. We would also like to point out that in addition to bringing dangerous white supremacists together in the Seattle area, Counter-Currents gives a platform for other local bigots to spread their messages. Local neo-Nazi, holocaust denier, and artist Charles Krafft (who has been well-documented both here and here) appears to be close friends with Johnson. Krafft is often mentioned in stories by Counter-Currents (see an archive of Counter-Currents Twitter mentions of Krafft here). Counter-Currents also frequently publishes articles by Covington, WA resident Christopher Buck (C.B.) Robertson. C.B is the white nationalist leader of The Cascade Legion (see Twitter mentions of C.B. Robertson here). C.B. was last seen hanging out with University of Washington College Republicans on January 20th 2018, in what appears to be preparation for The Cascade Legion to attend the College Republicans rally with Nazi magnet Joey Gibson on February 10th 2018. Seen in picture Chevy Swanson (president of UW College Republicans), Diodato Boucsieguez, Christopher Robertson, and Kyle Broussard. We believe Greg Johnson is a danger to our community. We believe that neo-Nazis and white supremacists should feel unsafe to walk our streets. The reclusive Johnson hates having his photo put out in public. Previously, there were only a couple photos available and a short video taken by Patrik Hermansson. Just last week, Greg Johnson threatened legal action against Hermansson and Hope Not Hate should they publish any video/audio taken in Washington state. 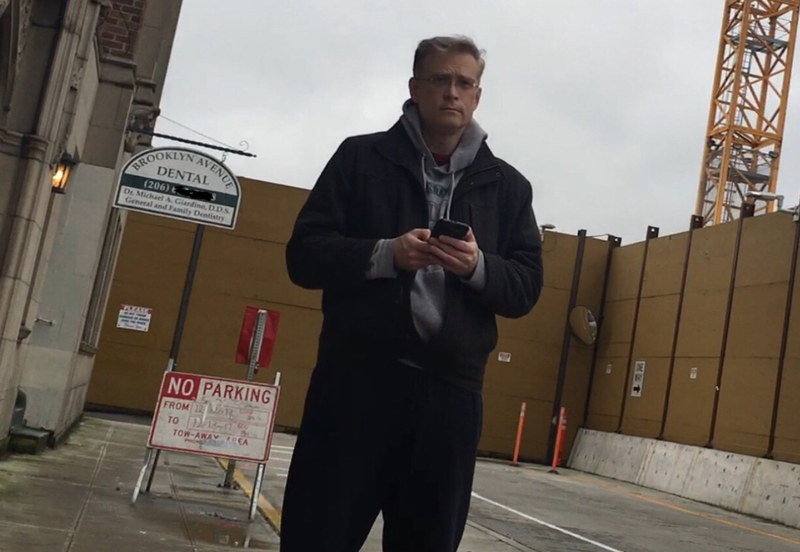 We publish these photos and his location to warn our community of his presence and in hopes that Greg Johnson can no longer find peace in the Seattle area.